Last Sunday, I did one of my favorite things. I went to a bead show! It was the Innovative Bead show held in Marlboro, MA. The show was set up in a way that I have never seen a bead show set up before. Each vendor had their own hotel room. So, I wandered up and down the hallway and in and out of rooms filled with tables of gorgeous beads and findings and jewelry. Of course, I went there for “only one thing”. hah! Am I kidding myself or what? Of course, I left with bags of treasure. I love all of my purchases but my most favorite strand of beads is the 5th strand up from the bottom. They are faceted grossular garnet. According to my “Firefly Guide to Gems“, there are many different types of garnet ranging in color from red to orange to brown to green to black and brown. The word “grossular” derives from the Greek word “grossularia” meaning gooseberry. The crystals can sometimes resemble the fruit in both color and shape. Yummy! Garnet also just happens to be my birthstone so perhaps I can make something special for myself with these beautiful beads. 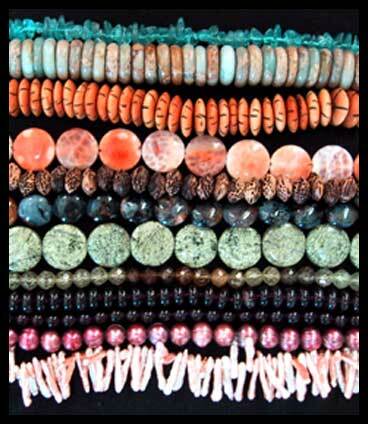 Do you like to go to bead shows? What have been your favorite purchases? This entry was posted in Beads, Inspiration. I went to the Intergalactic Bead Show this morning in the Asheville Civic center. Many booths were set up in rows around a large room. I shopped for two hours and left with two bags of goodies. I wish I could go back for the second day tomorrow – but I am afraid I have spent my alotment of both money and time…. I believe my favorite purchase today was a $15 string of coral – just the size and color I was looking for. Unfortunately I think I didn’t buy enough small spacer beads to go with all the beauties I found, but I guess that will have to wait.